Quinn is back at McKinley after her car accident. She is “temporarily” disabled from the waist down so she is using a wheelchair to get around. 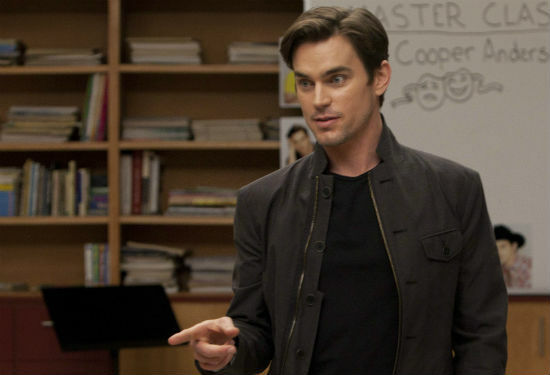 Blaine’s older brother, Cooper (Matt Bomer), returns to Ohio and gives The New Directions some horrible/awesome tips for getting notice in Hollywood. Principal Figgins makes Roz the co-coach of the Cheerios. Prompting Sue to make a deal with Figgins to get complete control back. She just has to make sure The New Directions win at nationals. Puck tells Finn that he has a better chance of being successful if they move to Los Angeles together and strike it big in the lucrative pool cleaning business. Blaine confronts Cooper about being a more accepting big brother. Sue learns that the child she is carrying is a girl but her amnio had some “irregularities”. Driven or Denial? Initially I thought we were going to be witnessing a funeral when Glee returned then I realized this show isn’t going to – literally – kill off an original character this close to graduation. So when I saw Quinn in her wheelchair I thought she and Artie would become new besties -obviously. But I can’t tell if Quinn’s paralysis is permanent or not. I like the fact that Artie is trying to help Quinn adjust but she has proven to be fragile mentally. Artie should tread lightly. (More) Trouble In Paradise: Finn and Rachel just can’t catch a break. If it isn’t Finn worried about his role in New York or Rachel even getting into NYADA there is flack about their wedding or Puck trying to take Finn to the left coast to clean pools. A good ol’ RPS (Rock, Paper, Scissors) solves most (all) of my toughest decisions. Apply liberally. Just Some Advice…DO NOT step on Jesus Joe’s feet! I Missed Blaine: I know The New Directions have added characters and split into separate factions and all that jazz but I just enjoy seeing Blaine perform. It will never be the same as his days at Dalton Academy but when Blaine goes solo he is almost untouchable. It’s a little sad that it took a tragic car accident to get Artie and Quinn not only interacting, but singing together. Very cheery and a very Glee way to bring fun to something that would be a much more serious issue in the real world. Although their voices compliment each other, Artie’s only performance soul-mate in the group will forever and always be Mike Chang. There’s a good chance you either constantly find yourself nostalgic for the 80s, enjoyed these Duran Duran classics when they were actually on the charts or played the more popular hit on Rock Band. Whatever group you fall under, you probably enjoyed this performance, which is understandable since it was so good. Mash-ups are clearly no longer a special event, something I equal parts loathe and love. 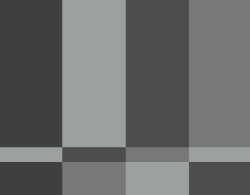 However, in this particular instance, both songs made the performance feel slightly rushed. Also, there’s no way Blaine was ‘a little pitchy’ or had moves that ‘lacked a theme’. The amused look on Cooper’s face when Blaine began singing was reflective of my thoughts throughout the entire song. The shower scene was incredibly awkward and it was so hard to take Blaine seriously with Cooper’s TV commercial playing in the background. None of this was for lack of passion and excellence on Darren Criss’ part, but this might have been one of my least favorite Blaine performances of all time. Visually, this was a great performance and similar to the Givers, they incorporated the joy of the lyrics. Quinn and Artie enjoyed their Senior Ditch Day at the skate park, while the rest of ND spent the day at Six Flags. It seems like Artie is constantly finding new ways to bring happiness to less than stellar circumstances. Somewhere, a hipster put on their Ray-bans and shed a tear that Glee covered Gotye and Kimbra. Kudos to the writers for interpreting the lyrics as something more than a love song, but did anyone else feel like they forced the relevance just a tad so they could use this song? Regardless, Blaine sounds good singing just about anything and Bomer proved that White Collar really needs to do a musical episode. I agree on everything you said about Quinn. I think it’ll be temperary because she is signed for Season 4 so they probs won’t make her be in a wheelchair for a whole next season 😉 And I love you called him ‘Jesus Joe’ LOLOLOL! Absolutely agree about Blaine! We need more solos from him, he’s just such an amazing performer.